What do unicorns eat? Only the most magical candy in all the land! 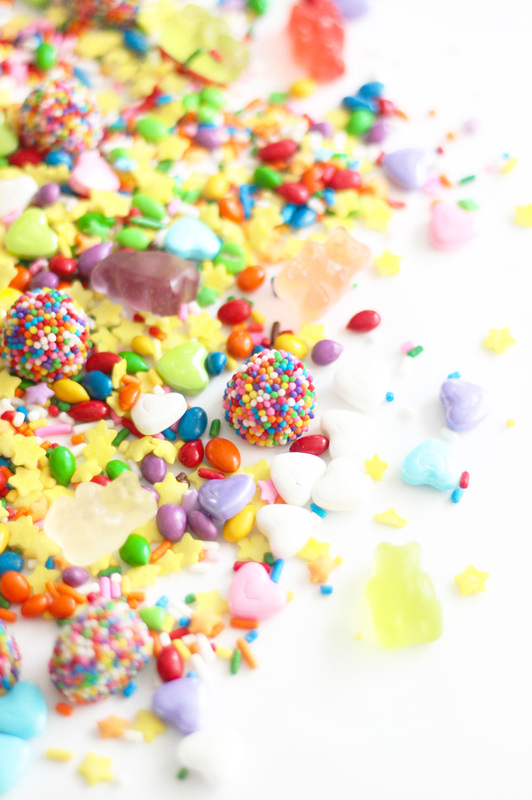 My Unicorn Food mix contains iridescent hearts, candy stars, sprinkle-covered gumdrops, rainbow candy-coated sunflower seeds, gummy bears, jimmies and rainbow nonpareils. 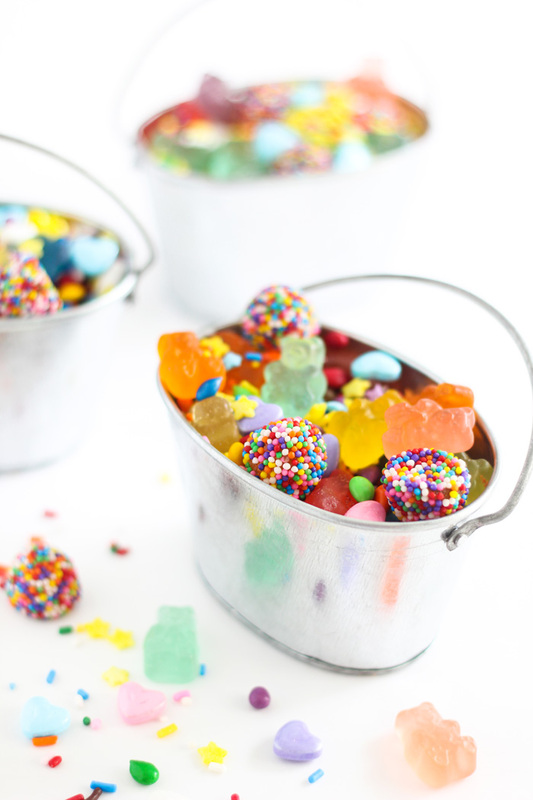 You'll find my recipe below with links to all the candies I used, but this mix can be endlessly varied to include your favorite candies. Next time I'd like to include mini marshmallows or rainbow licorice laces. I'm sure you probably have lots of great ideas for Unicorn Food (and I'll take any suggestions in the comments!). I found the small galvanized buckets here, and they reminded me of the feeding troughs my grandparents used to have on their farm. I think they'd make a cute display for a unicorn-themed birthday party. The unicorn figurine (I named him Blue Boy), can be found here. Combine all ingredients in a large zip-top bag. Turn sealed the bag over several times to mix the candy. 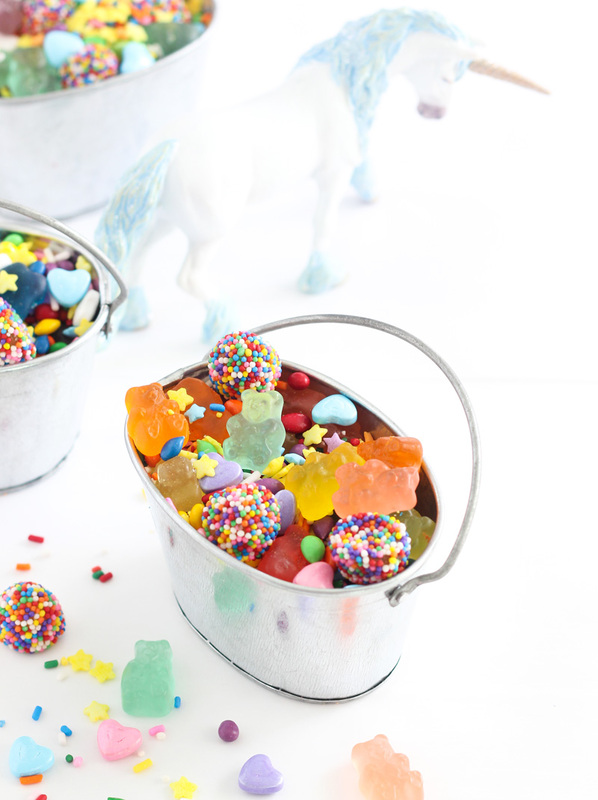 Display in small galvanized buckets or place in colorful cellophane bags. Yummy yummy! this looks so good! Oh heather I am so disappointed. First it was Nigella telling me how to 'smash' an avacado on toast, now you are instructing me how to mix candy. C'mon please have more respect for your fans. Bruce, It's my job to put my inspiration on this blog. That's what I did today. I'm sorry you felt the need to publicly scold me. Hello Heather, I am sorry Bruce was so rude!! I actually needed to 'see' this in order to make it. Thank you from those of us that need that bit of inspiration!! You're blog is the best!!! I think this is your blog and you can post whatever you want. It certainly isn't as challenging as some of your other offerings but it wasn't meant to be! It's lighthearted and fun! Enjoyed it! While Bruce is entitled to his opinion, but like all things, it is all in the delivery! People should realize how much work it actually takes to create something, from concept to post editing. I admire everything you post. i am pleased that you voiced your opinion. Stay awesome Heather! "Don't bring me doooooowwwwwn.... BRRRRUUUUUUUCE." Said ELO and every. Fan. Of. SprinkleBakes. Heather, This is so clever and I love it! I've never heard of/seen sprinkle coated gumdrops! Woo hoo for your brilliance! XOXO! Anything covered in sprinkles makes me happy. So colourful. 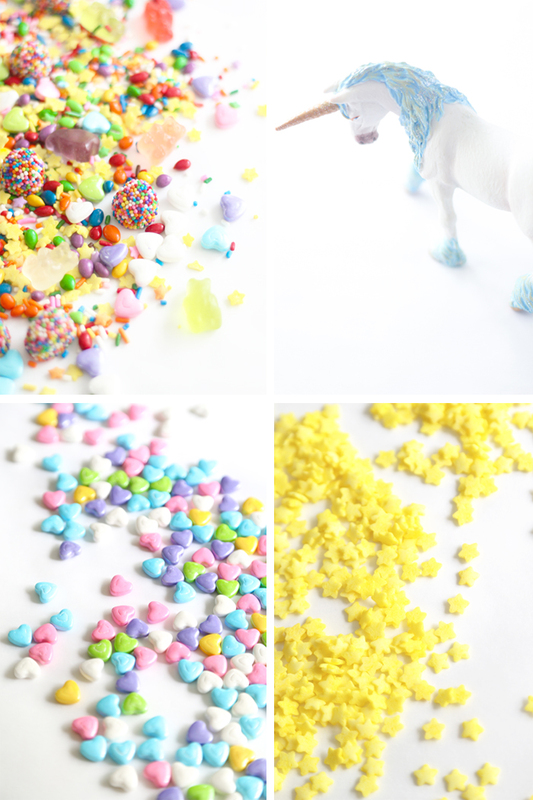 Next Stop (for me at least): Unicorn Bark - all of this colorful goodness on a sheet of white chocolate - yum!